Most recent grammarians, following the lead of Otto Jespersen and others, would have us view the grammars of the modern languages as living bodies in states of constant flux. According to this view, many of the grammatical structures inherent in the ancient, "parent" languages such as Greek and Latin have, for practical purposes, disintegrated and are no longer relevant. If the form of a grammatical element is no longer distinguishable, it is said no longer to exist and thus it does not warrant our attention. This approach requires varying and not always satisfactory re-descriptions of the grammatical functions of the different languages. Much like the Deconstructionist literary theory of a later generation, the Jespersen view, for good or ill, swept the field. It had about it a panache, an easy glamour of the "modern" that proved difficult to resist. Those who opposed this view, among them the distinguished English classicist Edward Adolf Sonnenschein (a mere nine years older than Jespersen, but spiritually from a different world), could safely be brushed aside as fossils if not scholarly fuddy-duddies. Sonnenschein's approach was quite different from Jespersen's. He sought to discover, as it were, a common "soul" infusing the different bodies of grammar and rendering them capable of common description. Far from finding the traditional grammatical descriptions irrelevant, Sonnenschein saw in them a set of ready-made, intra-linguistic distinctions capable of rendering sensible the intricate, partially hidden webs of functionality in modern languages. Just because the dative form in English is no longer distinguishable does not mean there is no dative function persisting in the "soul" of the language. To pretend otherwise is to distort our understanding of the language as a whole, rather like trying to force-fit the pieces of a jigsaw puzzle where some are missing. Does it not make more sense, knowing what the missing pieces are, to put together the puzzle around the missing bits, exposing them negatively in the process and so arriving at the intended proportions? 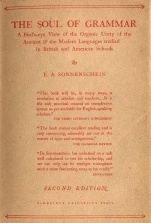 SONNENSCHEIN, Edward Adolf (1851-1929), classical scholar and writer on comparative grammar and metre; BA, University College, Oxford; professor of Greek and Latin at newly founded Mason College, Birmingham (afterwards Birmingham University), 1883-1918; Plautine scholar; published editions of Captivi (1879), Mostellaria (1884), and Rudens (1891); took up reform of grammar teaching and published "Parallel Grammar" series, which was warmly welcomed in Great Britain and on the continent; joined J. P. *POSTGATE in forming Classical Association, 1903; much of his grammatical research summed up in The Unity of the Latin Subjunctive (1910) and The Soul of Grammar (1927); insisted upon the humanities taking their proper place in the modern university; took up question of war-guilt during European war; a very exact scholar. The Soul of Grammar, first published in 1927, was the summation of Sonnenschein's thinking on the subject and represented his answer to Jespersen's Philosophy of Grammar (1924). The present text is taken from the second edition, published with Addenda in 1929 shortly before Sonnenschein's death. The entire text was scanned in color, two pages at a time, at 300 dpi and converted to DjVu using the default options. It has been subjected to OCR and is fully searchable. In addition, the items in the table of contents have been linked to the appropriate pages. The Soul of Grammar is not "light reading", but an erudite text with numerous examples drawn principally from six languages including Greek and old English, which require different alphabets or orthographical conventions. As such, it seems made for DjVu presentation on the Web, which might even go some way toward stimulating a re-evaluation of the work of this "very exact scholar". Return to the DjVu Document.